Are you someone who possesses the following VALUES. ? Establishes a high level of trust & credibility with other , values professionalism, integrity ,dependability , reliability, adaptability flexibility ,initiative taking , hungry for knowledge & learning & is desirous of leaving an impact ? Do you possess the following SKILLS ? Understands Empathy , keen insight into behaviour, active listening, social perceptiveness ,strong communication, comprehension,coordination &, human services orientation . critical thinking , complex problem solving ? Do you have the following ABILITIES ? Oral comprehension & expression ,deductive & inductive reasoning & fluency of ideas ? Well if you said yes to all of the above we would like to talk to you. 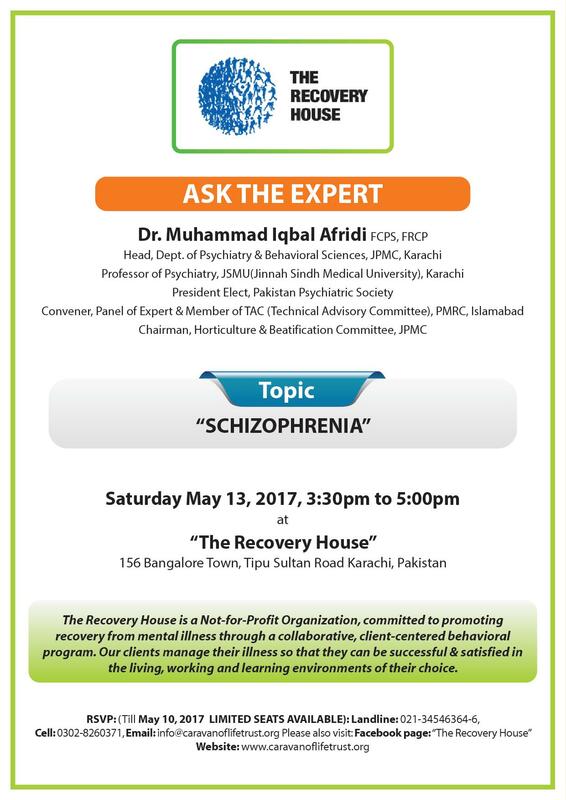 The Recovery House, a Pioneering ,Psychiatric Rehabilitation program in Karachi, is seeking such a UNIQUE candidate . Qualifications : Masters in any Human services field ,English & Computer proficiency , min. 5 years work experience preferably in a human services field . Candidate should be in pursuit of a career path , not a job & wants to be a core part of a Pioneering field . TRH offers a range of internship opportunities for students pursuing a degree in Clinical Psychology, Counseling Psychology or Mental Health programs, particularly at the graduate level. Our programs provide opportunities for students to gain experience in case management, therapy, psychiatric rehabilitation, outreach work, group psychotherapy, residential care, supported employment, and documentation. Each student is provided with individual clinical supervision and group supervision with their team. 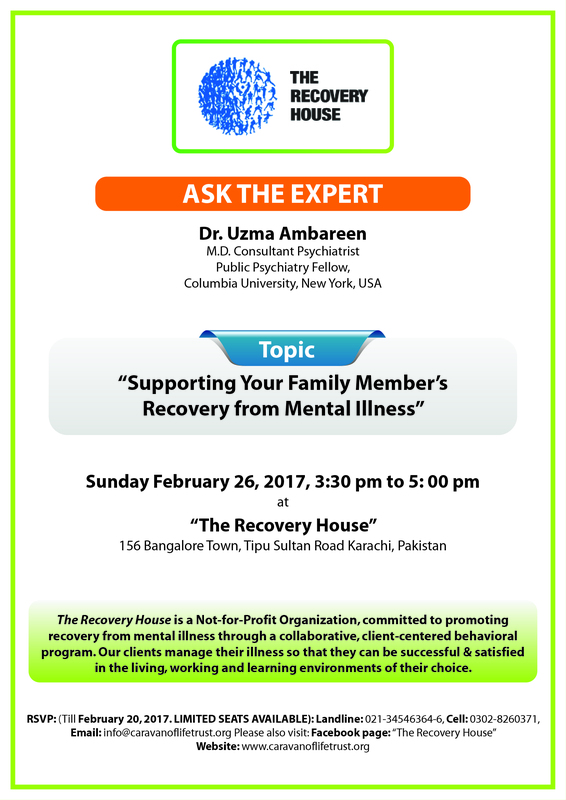 Students in the clinical internship program are also encouraged to attend trainings offered at The Recovery House that focus on the implementation of Evidence-Based Practices in the field to provide the best possible support services for our members. The combination of supervision, training, and the holistic service model used at TRH provides a unique training experience for students working toward a clinical degree. TRH always has its doors open to volunteers! We invite applications especially from individuals who can involve our clients in activities such as arts and expressive arts, photography, yoga or physical training. But more than that, TRH loves people who would be willing to dedicate their time to us and help us spread the word! We regularly assemble groups of young individuals to assist us in fundraising, advocacy, awareness, and planning and event management. Please note, volunteers are selected after a review of their resume as well as an interview with our president and then director, so only serious applications are invited as the privacy and safety of our clients are of utmost importance to us.